The first day of September is a portentous date isn’t it? Heralding the end of care-free summer days, and the beginning of school. And when I was growing up in Fredericton, New Brunswick, the event we kids waited for all summer, and saved our pennies and quarters for… The Fredericton Exhibition. The Ex. always started the week that we went back to school. So the beginning of September was anticipated with longing and dread in equal measures. The picture below on the left is of Scout’s first day of school in To Kill a Mockingbird. She’s all gussied up in a new dress and none too happy about it. She’d much rather be wearing her overalls. I remember kids going barefoot all summer when I was little. And like Scout many of them chaffed at having to become “civilized,” in their good clothes and shoes, for school in September. 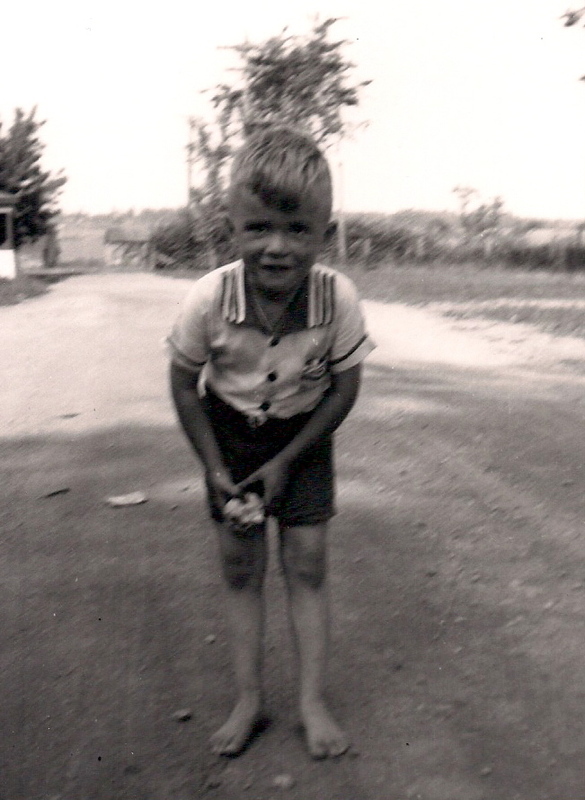 The shot below is of my mother’s baby brother, Everett, taken one summer in the 1940’s. Isn’t he sweet in his little shorts and bare feet? Like all the other kids, I both longed for and dreaded the coming of September. But while the thought of school made the butterflies dance in my stomach, I couldn’t wait to wear my new shoes and my new first-day-of-school outfit. ‘Quelle surprise,” I know. I remember vividly the yearly shopping trips “across the lines” for our back-to-school outfits when I was a kid. One of my grandmothers lived near the Canadian-U.S. border, and everyone shopped in the States,”over across” as we called it, where the selection was bigger and the products a lot cheaper. I’m sure the border guard didn’t suspect a thing when, at the end of the day, Nana’s car rolled up to his wooden hut. “Anything to declare, Mrs. K?” he’d say, while he peered into the backseat where us kids sat, looking innocent in our new duds. “No George. (or Frank, or Sam… she knew all the guards by their first names) Just a few groceries.” It’s not really smuggling if the guard knows darned well that we were clothed entirely in outfits purchased that afternoon… is it? I’ve been back-to-school shopping most of my life. As a child, a high school and then university student, and then as a teacher. But this year was different; I did most of my fall, back-to-school shopping, in July. I wrote about that adventure in this post. And while I was still wearing my summer tank tops and sandals, my new fall purchases hung in my closet, taunting me, for weeks. Until the other day. When, even though the weather said it was still summer, I deemed it was time to start transitioning into fall…. slipping into at least some of my lighter weight fall clothes and combining them with my summer staples. So, out came my cropped, white, NYDJ jeans, and my black Helmut Lang jacket. Both have done yeoman duty this spring and summer. I ditched my sandals in favour of my Stuart Weitzman loafers. And added this striped, grey and sage green, long sleeved Vince tee shirt. The tee shirt is one of the purchases I made at the Nordstrom Anniversay Sale in July. I bought the same shirt in white two years ago, and it’s become a staple in my fall and winter wardrobe. It has very long sleeves, which are great for my very long arms. It falls away from the body, good for covering middle age middle. And I love the dropped shoulders, the side slits, and the fact that it’s longer in the back. See. 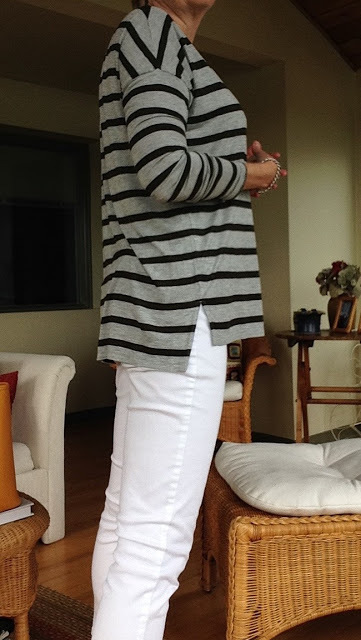 So I’m off to Nordstrom in this transitional, mostly summer but slipping somewhat into fall, outfit. I’m having a make-up makeover today. Katie, the lovely girl who manages the Laura Mercier counter at Nordstrom is going to show me a new way to do my eye-liner, and at the same time give me a new fresh look. I can’t wait. And I’m excited that my new look will be featured in the “Midlife Makeover” series on the blog Daily Plate of Crazy. I’ve been reading D.A. Wolf’s blog for over a year now. It covers everything from relationships, to women’s issues, to fashion, to musings about life after 40. You should check it out. And be sure to check out her post Midlife Makeover: Shake Up Your Makeup. Love that title. I love having a new make-up palette for fall. I’ll write my own post about my make-over experience soon. Once I master the skills I’ve learned, that is. I guess I should start calling my fall shopping “back-to-school…not” shopping. After all, this will be my third September without lesson prepping, and department meetings, and classroom decorating, and school dreams (nightmares, really) for two weeks before school actually starts. I had one recurring nightmare for years when I was a young teacher. I’d turn my back on the class to write on the board and, when I turned back around, the students had all tiptoed out of the classroom. And I was SOOO afraid the principal would come by my room and find that I’d lost my whole class. Phew. That was stressful. I’m not missing that tradition. How about you? Any back-to-school traditions? And how are you transitioning into fall when the weather says it’s still summer? I still love giving my wardrobe a fall update. I toyed with that Vince top but figured it would be too long for me. The outfit ooks great on you. Enjoyed reading about your makeover at DPOC!! Thanks, Sue. The DPOC post was great, wasn't it? As usual Sue, you look fantastic. Always classic, always fresh. 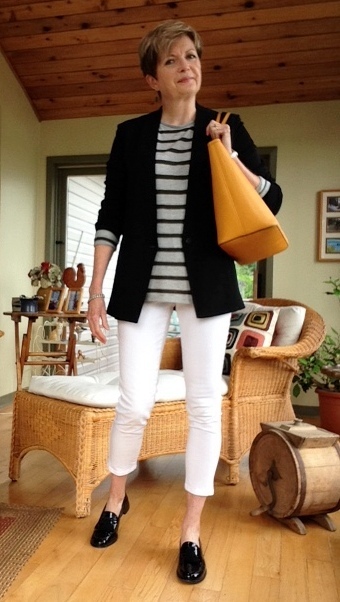 I love the horizontal stripe on you and that pop of color in the bag is divine. On another note – many thanks for doing the makeup makeover chez moi. I learned so much from reading about your experience and Barbara's. When I can scoot myself out to the nearest department store I think I'm heading to Nordstrom's! Thanks D.A. And thank you for inviting me to be part of your Make Over series. This is my first September without shaking knees. No anticipation of a new class. Whew! Your blog brought back so many memories! We used to do all of our back-to-school shopping in Great Falls, Montana, just across the border from home. Mom and Dad would make a weekend of it and we couldn't sleep for the anticipation. You are abolutely right about the greatest anticipation and the greatest dread all rolled into the first week of school! Cute, cute outfit! I've been wondering what do do about my newly-discovered and not yet friended middle-aged middle. I LOVE this top! "Bucks or blue and whites." It always took me a few days to wear them in. The kids would't be got dead in those today. Goodness who knows if they even make them. Love your outfit and now your inspiring metoshop Nodstrom's sales. Love Vince. Love your outfit. That's my kind of look. Thanks Sandra. I'm new to Nordstrom myself. Our store only opened in March and I first shopped there in April. I used to shop mostly at Holt Renfrew, but the Ottawa store closed last winter. I must say that I really like Nordstrom, but that's partly because their wisely hired some of the best people from Holts. 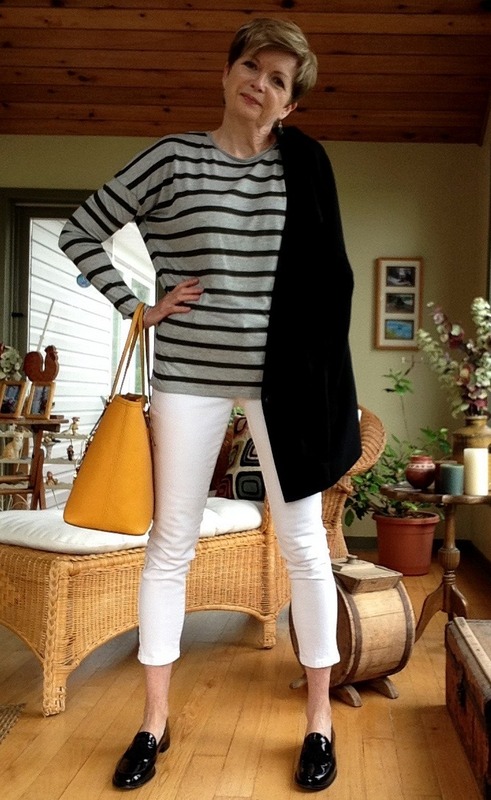 What a great outfit for transitioning to fall – the colour of the bag just makes it! You know what I'm doing to transition into my first fall not in the classroom…. Living out of a carry-on wardrobe capsule for 7 weeks! Cooler, wetter weather at home just before we're scheduled to fly has me second-guessing, but I'm going to keep counting on southern France and Italy staying warm and dry, fingers crossed! Thanks, Frances. What a lovely way to spend your first non-teaching September! Hope you have a wonderful time. You look adorable. I'm going to look for that top – from the comments it looks like it's a "Vince" brand? One of the nicest things about doing that makeover at Daily Plate of Crazy was finding you here. Happy Fall! Why thank-you Barbara…how kind of you to say that. Yep..the tee is Vince, one of my favourite brands. P.S. I subscribed to your blog too. Looking forward to all the talk of Paris since we were there for the first time in May. Thanks Jennifer. Now I just have to master doing it that way myself. Thanks, Robin. I use Bobbi Brown under eye concealer at the moment. It's a cream that you apply with a brush and them a translucent powder that you apply on top. It was a bit of an investment when I first purchased it because I had to get the two brushes as well., but I've been using it happily for years. I may give the Laura Mercier one a try next time, though. I liked it when Katie tried it on me last week. I'm really dry so I have to be careful that my concealer doesn't go cakey. I'd suggest going to a department store and asking the girls to give you a demonstration on your skin. I wish it felt like autumn here. Thirty degrees Celsius this week, and because of all the humidity, the mosquitoes are as bad as in July. I long for a cool, breezy, sunny fall day. Thanks, Jaymie. I'll definitely check out that link-up. You are a adorable. Love your haircut and outfit. Came over from Heather's. My first visit but I will be back. What a coincidence that as I'm reading this I just returned from the Bobbi brown counter at Nordstroms having a fall make-up make over. It was a well needed therapy session and I came away with a new fresh look. I love indulging myself this way, it's quite uplifting, don't you think. Looking forward to reading and seeing how your's went. You're right…uplifting indeed. I usually go to the Bobbi Brown counter for my fall freshen-up makeover. But this year I tried Laura Mercier for the first time. Once I can apply my eyeliner using the new method I learned, I'll write a post about my experience. Hi Susan, just wanted to thank you for your mention of Peter May's "The Blackhouse" a few posts ago. Wow! Great book, finished it this morning, and was still "in" it a couple of hours later- always a good sign! Am now off to download the next in the series. So glad you enjoyed the book. I'm jealous that you still have the other two still to read. I hope he continues the series. Enjoy! I'm still HOLDING On to SUMMER…………….CALIFORNIA GAL HERE. YOUR MAKE~UP do over was just GREAT!I follow DEBRA and loved it! Thanks. It was lots of fun and D.A. always writes a great post. I bought a couple of fall things and it's torture seeing them hanging in my closet and not being able to wear them yet! Love seeing Scout here! 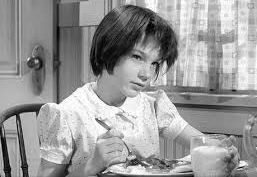 I've taught To Kill A Mockingbird almost every year of my 23 years teaching. Great loo, too, Susan! Thanks for sharing with Fun Fashion Friday and hope your weekend is off to a great start! I loved teaching TKAM. Think I have most of it committed to memory now! I loved this post!! How's the application going? Thanks so much for sharing with us in #stylefocus.